ProNutz is unique to the market. They offer people a sweet and salty snack with the added benefits of probiotics. Their pistachios on grown on their family farm in California. This blend in certified gluten free, non-GMO, and made with 100% natural ingreidnets. Each serving contains 1 billion CFU Bacillus Coagulans. 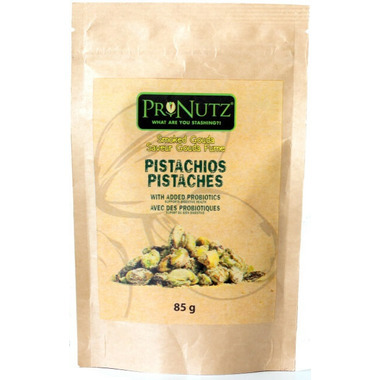 Ingredients: Pistachio kernels (dry roasted with sea salt), natural flavours, Whey, Gouda and cheddar cheese powder (Gouda and cheddar cheese [milk, bacterial culture, salt, enzymes], skim milk powder, Disodium phosphate, Salt, Lactic acid), Salt, Buttermilk, Onion powder, Brown sugar, Spices, Rice concentrate, Yeast extract, Bacillus coagulans, Organic inulin bacillus coagulans. taste good. a different source of probiotics. one star off for being expensive though.